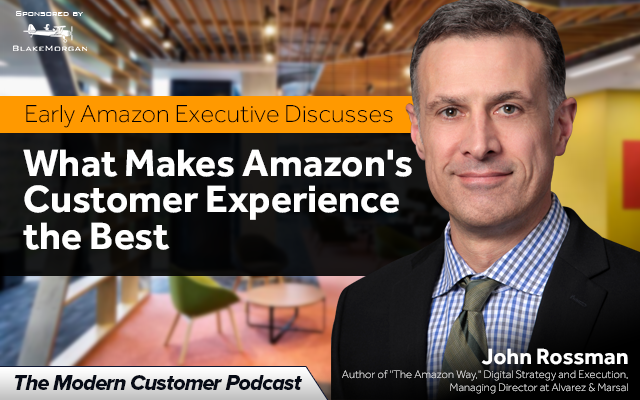 Amazon repeatedly tops customer experience lists in addition to every other category for innovation. So what’s the secret? John Rossman was an early employee with Amazon and started with the initial leadership team in the early 2000s. In his book The Amazon Way: 14 Leadership Principles Behind The World’s Most Disruptive Company he provides an inside-look at what makes Amazon so successful. Today Rossman serves as a Managing Director at consultancy Alvarez & Marsal. At a time when Amazon rarely talks to the press Rossman’s book looks at all the reasons why Amazon remains competitive and the decision-making that makes the company consistently high performing. Don’t miss these critical tips in today’s modern customer podcast.